Last week I was a bit MIA, because I took my yearly trip to visit my Mom in Florida. A few years ago my parents decided they had enough of winter and became snow birds, spending their winters in Marco Island, Florida. 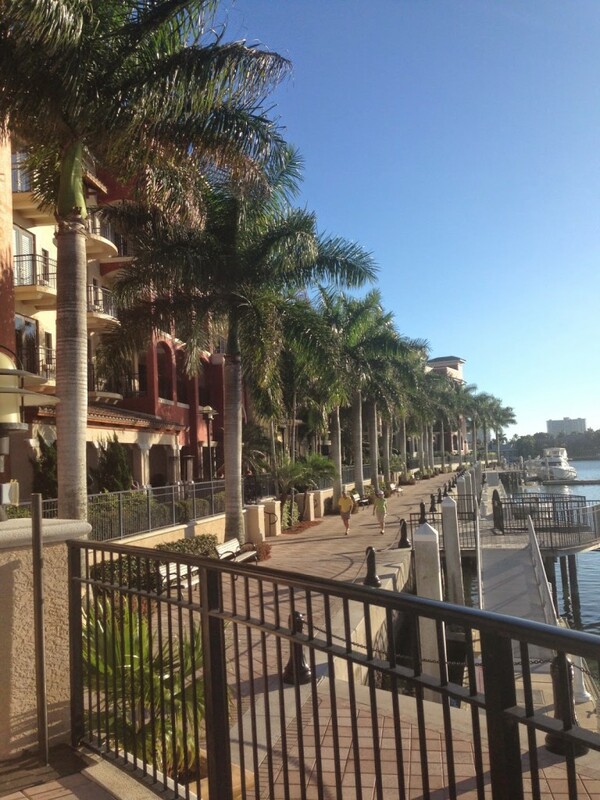 I’ve been to Marco Island a few times and here are some of my favorite attractions in and around Marco Island. If you do one thing while in Marco Island, visit Tigertail Beach. The beach is beautiful and peaceful. The water is shallow which is perfect for little kids. They also offer a ton of activities (at a cost) right on the beach. 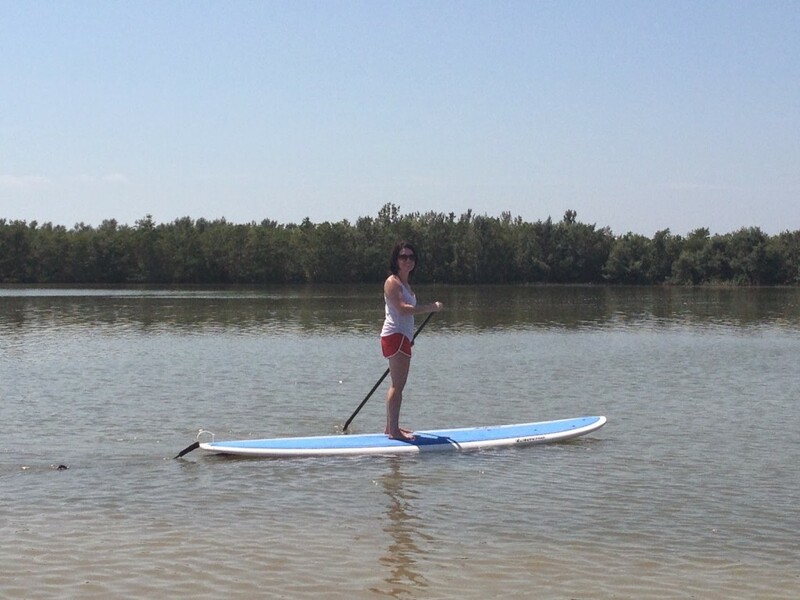 So you can rent a peddle boat or a kayak or a stand up paddle board. I’m preferential to the stand up paddle board and having done it 3 times at Tigertail Beach, I think this is the easiest and best place to learn how to SUP. There is also a cafe, bathrooms, and a playground. And you can wade through the water to get to the beach on the gulf side, which is a really cool experience. Nothing says southwest Florida or makes you feel like you’ve stepped into a Carl Hiaasen novel like an air boat ride. 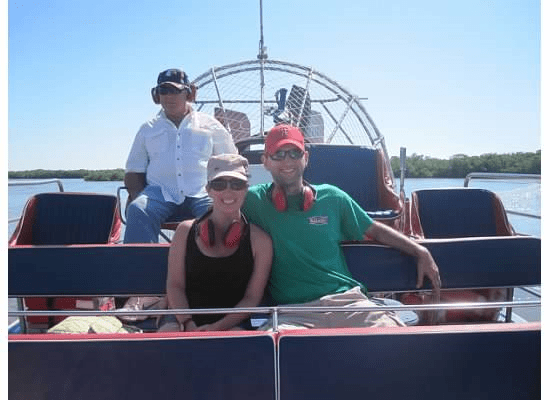 John and I took an air boat ride on a trip a few years ago, it was definitely the highlight of our trip. The boats are flat and safe and great way to see the everglades. The company that we did our tour with is no longer in business but, there are lots of companies that offer these tours. One thing to keep in mind if taking little ones is that the boats are very loud and they provide you with headphones but it might still be too loud for young children. Nothing says relaxing vacation like a massage. I highly recommend Salon and Spa Botanica in Marco Island. I’ve had 2 massages while here and Carlton does a great job of making you feel comfortable. You will walk out feeling like a new person. If you talk to anyone in Southwest Florida about outlet shopping they will likely mention the Miramar Outlets. There are over 140 outlets stores with such brands as North Face, Vera Bradley and Lucky Brand. My mom and I love to spend the day shopping here. 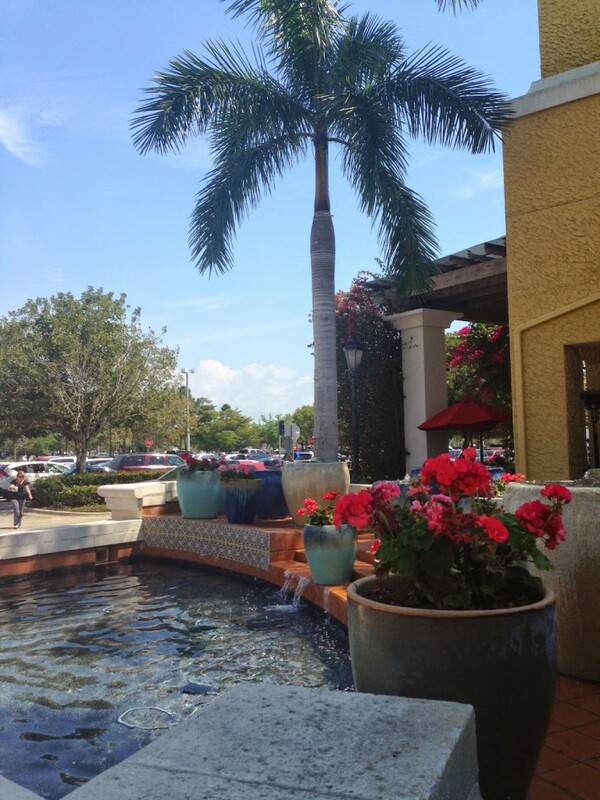 The outlets are beautifully landscaped with lush flowers and lots of pretty fountains. There is also an abundance of dining options our favorite is Naples Flatbread and Wine Bar, the apple and goat cheese bruschetta is amazing. When John and I went on our air boat tour we learned about the Stone Crabs that are caught in the area. They were in season and we asked where we could get the best Stone Crabs, our guides answer was The Little Bar. When you enter The Little Bar you will notice lots of nutcrackers decorating the place. It’s dark and shady, the way a bar should be. Then you head to the back deck and you have a beautiful view of Goodland and the Everglades. It’s the perfect place to grab a corona and watch the boats go by. 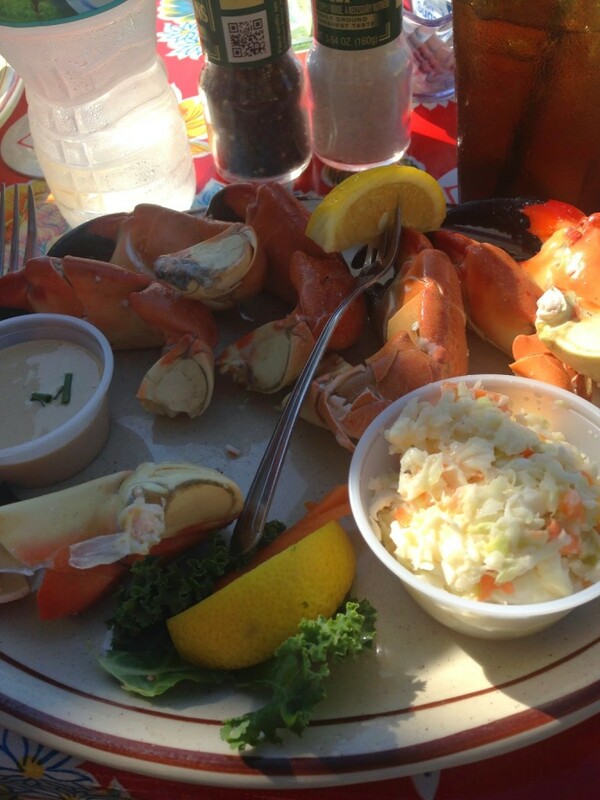 And those Stone Crabs, so delicious, easily one of my favorite meals. The Marco Island Farmers Market takes place on Wednesdays in season. The farmers market features fresh fruits and vegetables along with craft vendors, jewelry vendors and home made pastries. There are also several bread vendors and prepared foods for sale. 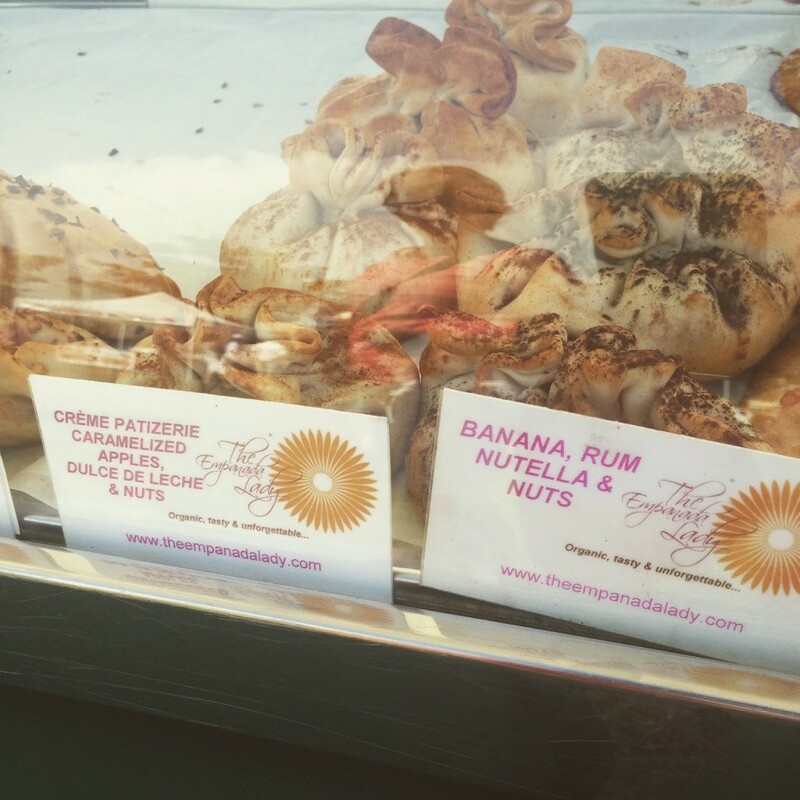 Make sure to try the paella and to check out the empanada booth that features interesting empanadas like Banana Rum Nutella, yum. There are so many wonderful dining options in Marco Island, and I can’t remember having a bad meal. I recommend CJ’s on the Bay for it’s great food and gorgeous view. Chop 239 has an excellent wine list and the outside seating is perfect for people watching. DaVinci’s has the best espresso martini along with great Italian food. Nacho Mamas Ahi Tuna Taco is one of my favorite meals and nothing similar has ever compared. Have you ever visited Southwest Florida? 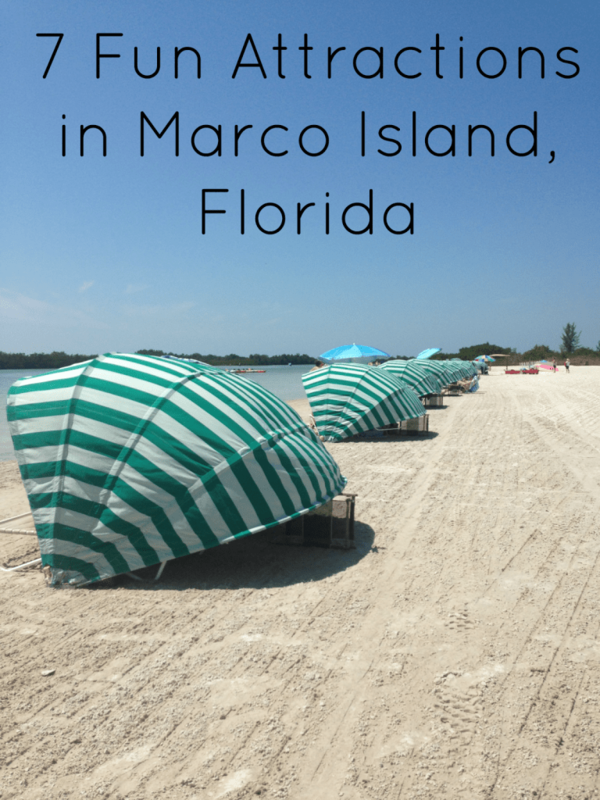 Been to Marco Island? Visiting Southwest Florida with kids? You won’t want to miss what to do in Marco Island with Kids. Looks AMAZING! We are always on the lookout for new places to explore. It's not even 8 am and the pics of the crabs have me drooling! I want to goooo! Looks awesome, I have heard so many great tales about Marco Island, its on my Bucket List! That view from the bay looks gorgeous! Visiting Florida is on my list for 2015! Just went there for the first time with friends! Pinned your post for when we go back! It was lovely!